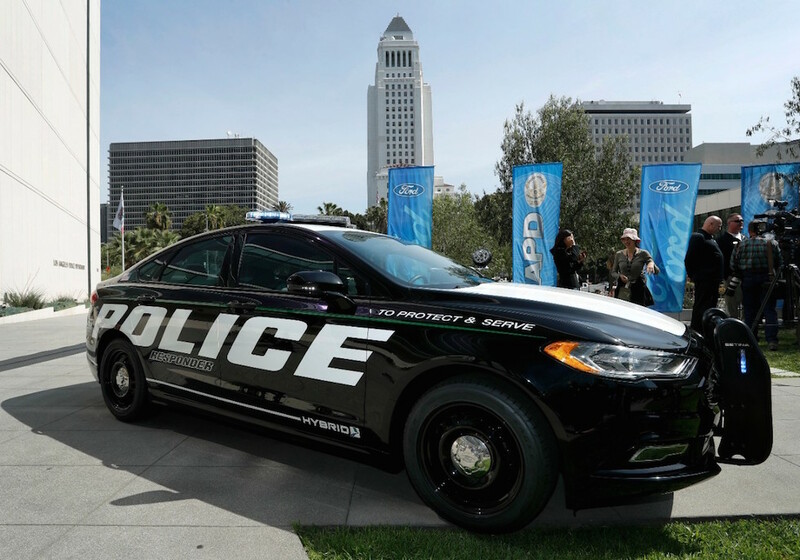 Ford has unveiled the Police Responder Hybrid Sedan, an industry first pursuit-rated hybrid police car that has debuted in the USA. The vehicle, which could save police departments several thousand dollars a year in running costs, forms part of Ford’s $4.5bn investment into electric vehicles. The latest vehicle debuted yesterday, April 10, 2017, in New York and Los Angeles. As well as helping to fight crime, the new Police Responder Hybrid Sedan is expected to assist cities by decreasing emissions, and offer potential fuel savings whilst driving and idling. While driving, Ford’s hybrid technology is projected to provide US Environmental Protection Agency (EPA)-estimated combined petrol mileage of 38 miles per gallon compared to current Police Interceptors with a 3.7l V6 and EPA-estimated 18mpg combined. While idling, the Police Responder Hybrid Sedan’s lithium-ion battery helps deliver the high electrical loads of a police vehicle, reducing engine run time and saving an estimated 0.27 gallons of fuel per hour. According to Ford, Police Responder Hybrid Sedan customers could see nearly $3,900 a year in potential fuel savings per vehicle relative to the Police Interceptor, if a police vehicle is driven 20,000 miles per year, runs two shifts per day, 365 days per year, idles 4.9 hours per 8-hour shift, and is fuelled at an average gas price of $2.50/gallon. The new vehicle will be the first hybrid sedan with full pursuit capabilities and is certified by police agencies as capable enough to handle police pursuits for longer periods at different speeds, and over obstacles such as curbs. The Police Responder Hybrid Sedan uses an Atkinson-cycle 2.0-liter engine, an 88kW A/C electric motor and a 1.4kW lithium-ion battery. The hybrid is calibrated for law enforcement’s unique duty cycle and will run in battery-only mode up to 60mph. According to Ford, the car automatically switches to maximum performance – with the engine and battery working at peak acceleration levels – when needed. Ford currently sells the most police vehicles in the United States, with 63 per cent market share. “driven by an advanced 1.4kW lithium-ion battery” :: NOPE it’s a 1.4kWh battery maxed as 35kW top-up for 140kW peak power (caradvice.com.au). Plausibility paucity indicative of ignorance yet again as another grave-turner for Engineer’s founding fathers! PS Similarly rated rapid transient dis-recharger demoed in defconXies duodemidecade ago using stabilised sonication. Abhorrent anomalies righteously rectified with rapid recap at Ford HQ for firm facts. Hear, Hear, what hope for the next generation when virtually no technical writers ever know the difference between power and energy. Definition difficulties are indicative of ignorance about elementary essentials, seriously scary after decades of downdumbing dogma since educationalists elected egalitism over elitism, this recently reinforced by HEIs sacrificing syllabuses in dash for cash, such that my sixties schooling scoped to stuff too tough for nineties engineering finalists! Censoring criticism for correctness compliance is sadly simply a cultural corollary that more often than not has denied my delivery of critical comments.